The big economic news this past week was the release of data for 2nd quarter gross domestic product (GDP) on Friday. The headline was that during April to June, the economy expanded at an annualized rate of 4.1 percent. Heady stuff, but it immediately raised two questions: (1) Is this a one-time fluke or a sustainable trend? and (2) How much of the more rapid growth can be traced to changes in economic policy? The first question was raised by stories about acceleration of international transactions to beat the imposition of tariffs, either by the Trump Administration or other countries in retaliation. (Recall the story of the cargo ship attempting to get to China before tariffs were imposed.) Indeed, many analysts pointed to more rapid soybean exports; they could have added a couple of tenths to the growth rate. But at the same time shifts in inventories subtracted a full percentage point from 2nd quarter growth. My bottom line? On balance, one-time timing shifts had little to do with the rate of growth. Another perspective on sustainability is portrayed in the graph below. It shows the quarterly growth rate of GDP, measured over the four quarters from the same quarter one year earlier. The economy has been accelerating steadily over the past two years and now is running at least a half percentage point faster than the 2.2 percent average during the recovery in the Obama years. A full 0.5 percentage point acceleration in growth is a great accomplishment. While the economy may not stay at 4.0 percent growth for the foreseeable future, one can be much more confident of 2.8 to 3.2 percent growth. What about the contribution of policy changes? The acceleration since the start of 2017 is suggestive of the importance of the sharp regulatory rollback under President Trump. The other key policies have been the Tax Cuts and Jobs Act (TCJA) and the omnibus spending bill signed early in 2018. The chart below takes a look at these policies. The centerpiece of the TCJA is the improved taxation of business income and the investment incentives. Since it has been only seven months since passage and because the Treasury has not even finalized the regulations that will implement the law, there is no reason to see the full effect just yet. 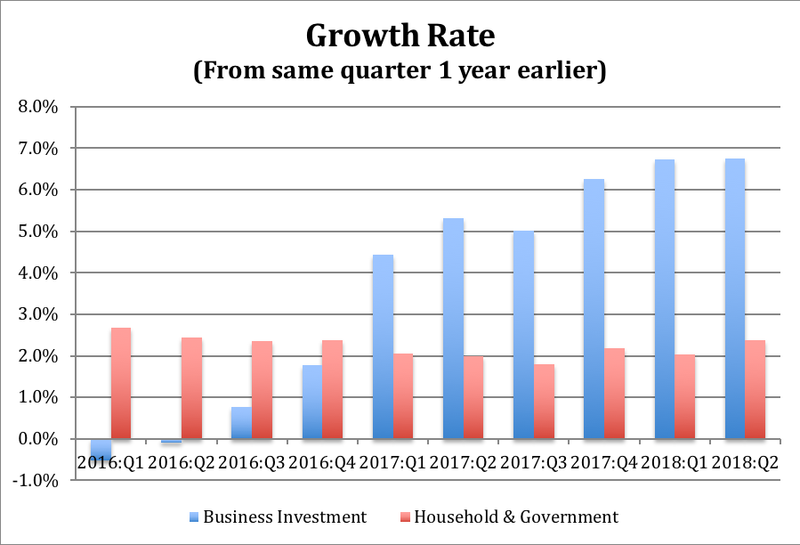 But it is suggestive that non-residential fixed investment (“business investment,” blue bars) has improved steadily and jumped immediately after the passage of the bill in 2017:Q4. Similarly, if the tax cuts and government spending juiced the economy, one would expect to see a sharp rise in combined household and government spending. Of course, one would also fear a sharp reversal after the front-loaded tax cuts and spending run out after 2019. Spending did rise somewhat this past quarter, but not so dramatically as to cause concern. The bottom line seems quite promising. The economy is strengthening steadily at sustainable rates. Better economic policy is reinforcing this trend, but not dangerously overheating the economy. Trump Says He ‘Opened Up Europe’ for Farmers. Europeans Disagree.